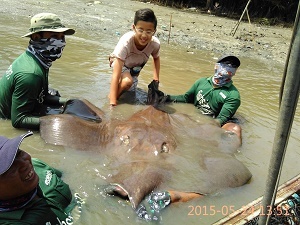 Freddie and his son from Singapore visited the Maeklong River stingray fishing in Thailand on a short day trip. The anglers were soon fishing for Giant freshwater stingrays on a wide section of the Maeklong River with baits positioned at various intervals across the water. After fishing for a few hours one of the baits was picked up by a stingray and battle commenced. Unfortunately the stingray was lost shortly after due to a hook pull. The anglers were soon into another Giant freshwater stingray which powerfully moved away with the bait. On this occasion the hook held firm and Freddie and his son took turns to battle the stingray. The Giant freshwater stingray was beaten after a fifteen minute battle and carefully brought into the waiting net. 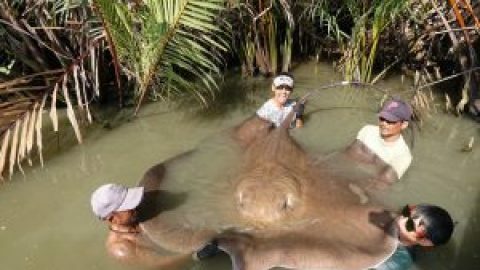 The Giant freshwater stingray was measured at a width of 1.4m and was estimated to weigh around 60-70kg.